Originating from northern Italy, polenta is made by mixing coarse stone-ground cornmeal with water and salt. This hearty porridge was an essential dish for many peasant and working class families. If the mixture was left to cool and solidify into a loaf, it could be baked, fried or even grilled. The Native Americans would serve a variation of this dish with various sauces, cheeses and fresh meat. In places like Lombardy, Italy, polenta is served as a side dish or in place of bread. However, you can also serve this dish as a main breakfast course. 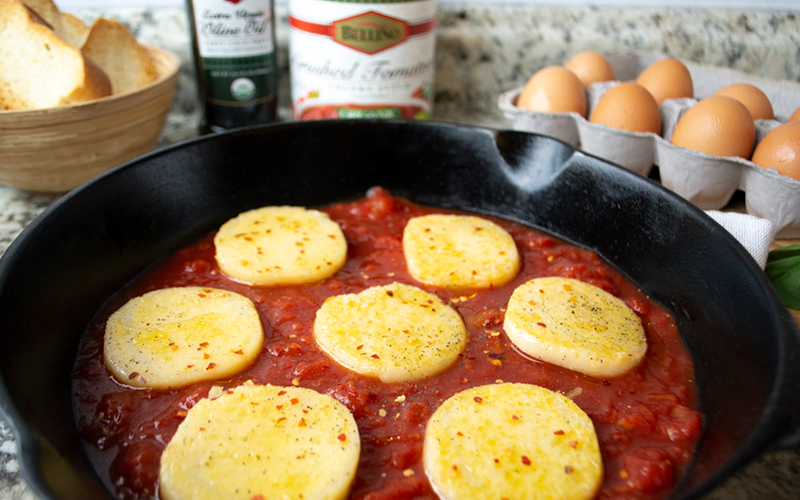 Convenient and versatile, Bellino Organic Polenta offers the flavor and velvety texture of traditional polenta without requiring constant stovetop attention. Serving as a simple flavor base, polenta can be seasoned to your liking and transformed to fit any recipe whether it’s baked, fried, grilled, sautéed, or used as a base for layering. Simply slice to fit your recipe and prepare as you would traditionally-made cooled and firmed polenta. 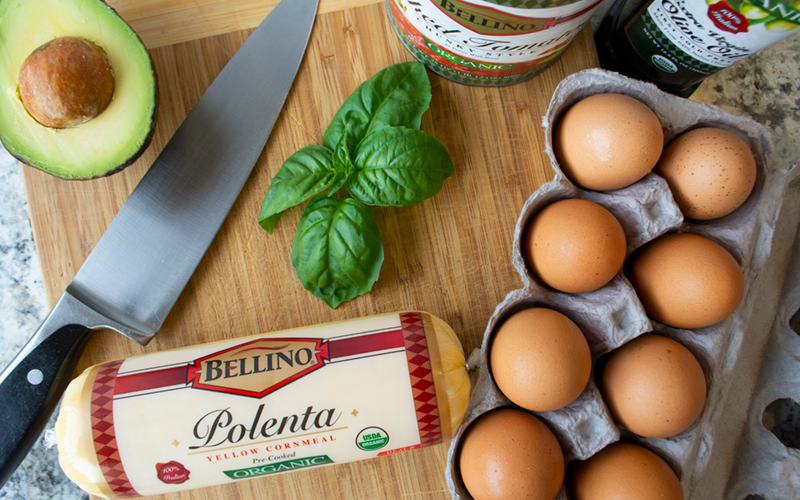 Bellino Organic Polenta requires no refrigeration before opening, making it a must-have NON-GMO staple for authentic Italian dishes any day or night of the week. For our recipe we used Bellino Organic Polenta, pre-cooked and formed, which makes cutting it into slices quicker and easier than instant polenta. 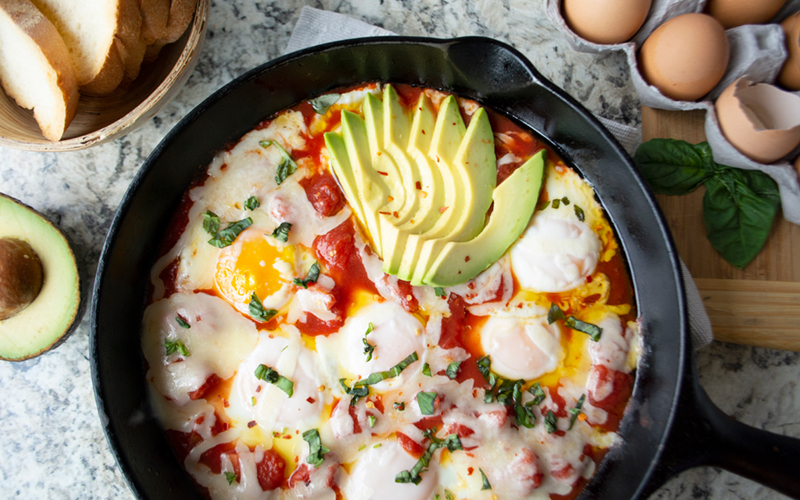 A helpful tip when creating this dish is to crack the eggs into a bowl and not directly into the skillet. This allows more control when placing them onto the polenta. The trick is keeping the eggs intact until you are ready to serve. We know this quick and easy dish will leave you feeling full and ready to start your day.